This interview was recorded in Denver, Colorado at the 2018 meeting of the Colloquium on Violence and Religion (COV&R). The meeting was held at the campus of Regis University from July 11 to 15. Jack Miles plenary lecture was titled, “Is the Qur’an the Word of God?” and focused on his upcoming book, God in the Qur’an. Suzanne Ross: Jack, you gave a wonderful plenary speech at the Colloquium about your upcoming book. For people who don’t know you, Jack, you are a well-known author, and a Pulitzer Prize winner author for, God: A Biography. That was in 1996. And then in 2002, you wrote, Christ: A Crisis in the Life of God which was a New York Times Notable Book. And then – I’m setting up your expertise to talk about the major religions! You are also recently the general editor of the Norton Anthology of World Religions. Could you say a bit about what that is, because it’s a massive project. Jack Miles: The Norton Anthology of World Religions anthologies texts from six major, living, international religious traditions: Hinduism, Buddhism Taoism for China, and then Judaism, Christianity and Islam. And we have texts from the beginning of their history to the present. Not all of their output, obviously. But what makes this work particularly relevant for anyone interested in these religions, is that these are texts produced by practitioners of the religions or their fellow practitioners. So, it’s not the opinion of a text book author. Of course, we have our framing commentary to set the context and so forth, but still the great bulk of the work is translated very often from Hebrew, Arabic or Sanskrit or whatever. SR: How many volumes is it? JM: In paperback it’s six volumes. In the hardcover edition which is beautiful and not very expensive, it’s in two very large volumes, a boxed set. The volumes have more than 2,000 pages each so overall the work has more than 4,000 pages. The paperbacks are much more fun to use, and I use it myself. SR: Do you? And your introduction to the set is quite beautiful. You have an upcoming book that’s at the publisher? JM: It will be published in November 2018 four months from now and it’s entitled, God in the Qur’an. SR: Would you tell us what your project was for this book and how it relates to everything you’ve been working on? 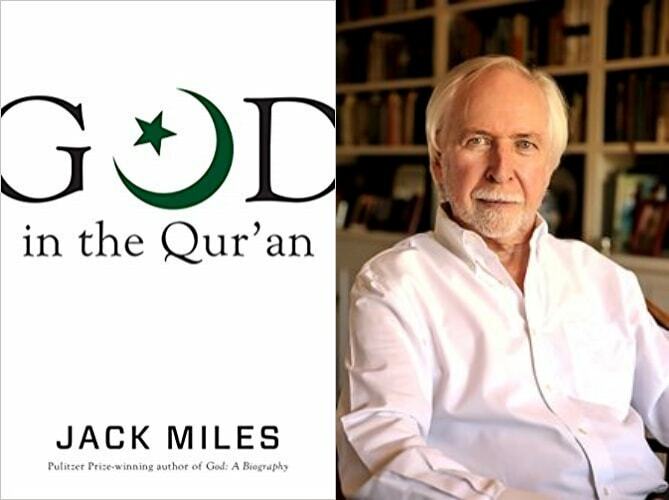 JM: After I published the first two books, people said to me, “Well, now you must do a book on Islam and God in the Qur’an”. I was very shy about taking on that task because I don’t know Arabic. I do know other Semitic languages and I do have what I call a smattering of Arabic, but that only. And the literature explanation of the Qur’an is vast and I didn’t think I had time to master it to the extent that I had mastered the relevant literatures for the Jewish scriptures and the Christian. But I found a modest way to do something modest but I thought useful. So most Jews and Christians don’t know that the iconic figures of their scriptures also appear in the Qur’an. So I took a set of these: Adam and Eve, who is just called Adam’s wife; Cain and Abel who just appear as Adam’s sons; then Abraham and his father, Abraham and his son; Moses; before Moses, Joseph; then Jesus; and Jesus and his mother, because she is very important in the Qur’an’s discussions of Jesus. And in each case I gathered together what the Qur’an says about each and discussed it and began pointing out the details in which it differs from what we find in the Jewish and Christian scriptures. These are sometimes quite fascinating, quite interesting. Not that they’re polemical or necessarily controversial but they are different and what might surprise some Jewish and Christain readers, I have no hesitation in saying that Allah is more merciful than Yahweh. JM: Well, they begin with, that’s true, with an announcement of Allah’s mercy. But also Allah conducts himself – and I know he should be called God. For convenience in the exposition I talked about Yahweh and Allah and then in the final chapter I dropped that and just talked about God. Because I have no doubt that the same being is being referred to. But take for example Moses sent by God to Pharaoh to liberate the Jews, to liberate the Israelites. In the Qur’an the real reason that God sends Moses to Pharaoh and to Egypt is to convert Pharaoh from his polytheism and make him a good monotheist. To teach him that there is no God but God. And his people with him. It’s true that the Israelites are to be let go because God wishes , but their liberation is an entirely secondary theme to the theme of the conversion of the Egyptians. As you may recall in the Biblical narrative, again and again Pharaoh relents, he’s going to let the Israelites go, but God steps in and hardens his heart and prevents him from submitting himself to the will of God. Not so in the Qur’an. But only at the last minute! It’s true that Pharaoh is recalcitrant and keeps declining to accept the Muslim truth and he leads his own troops into the Red Sea. They are all drowning and he’s drowning too, but at the last minute he says, “Moses was right! I am a Muslim! There is no God but God!” You might say it’s a death bed conversion in the middle of the Red Sea. So it’s a happy ending for Pharaoh and also a happy ending for Egypt, which after all today is a Muslim country! SR: Absolutely! So, it worked ultimately! You spoke in your lecture at the colloquium about the relationships between these three traditions and their claims to be complete and whole and the final word, if you will. And I wonder if you could talk about that rivalrous relationships between the traditions and what that means even today. JM: There is no portion of the Jewish Scriptures as read by Jews down to the birth of Jesus of Nazareth where some defect is noticed or some need for some new scriptures to take up the slack or add what is obviously lacking here. So, when the New Testament began to be written and when those who were reading began to refer to them as the New Testament and start calling what the Jews had never called the Old Testament, the Old Testament. Of course, those who were satisfied with the with OT continued to be satisfied and declined to accept what was on offer from the Christians. There’s a Hebrew saying, “There will never be another Moses”. So needless to say, then, most Jews have not accepted the contention of the Gospel of Matthew, obvious in how Matthew handles Jesus, that he is a new Moses. The same structural situation obtains with the Qur’an as against both the Jewish and Christian scriptures. Allah’s contention in Qur’an is that the Jews and the Christians have not correctly preserved the revelation that God gave them. Which is the same revelation, it’s not something new. It’s the same revelation but they messed it up, most especially the Christian’s did by claiming that Jesus was divine. God incarnate – that is unacceptable. So there is a correction on offer and historically Islam allowed the practice of Judaism and Christianity to continue with some important restrictions. But there was no doubt that the Muslim opinion was that their utility was at an end because now a superior alternative was available. Needless to say, the Jews and the Christians did not, in the main, accept this offer, so they tended to speak of Muhammed as an imposter and of the Qur’an as fake scripture. The last chapter in my book is entitled, Is the Qur’an the Word of God? The view that I finally take is that this is a question only God can answer. And this contention leads to the further question, when is he going to answer that question for us? And that in turn leads me in the conclusion to my book to say, let’s wait. Let’s not say it’s not a question, that all religions are the same. This is not really a plausible contention. There are important differences among them. Let’s allow the question to be a real question and say some day it will have a real answer, quite possibly not an answer that any one of these three will quite expect – God has ways of surprising his people. And if we have to wait a long time, if we don’t get the answer within our lifetime, so what? There are many other questions that will not be answered by the time we are on our deathbed. And this way we can find our way forward to asking a different question: I don’t think your scripture is the best of the three, not even pausing to discuss Hindu scriptures or many other religious writings in the world. But I am going to respect you for respecting it and honor that you and many others like you cherish it as an important fact in all our lives. And allow these different scriptures to be validated provisionally by the consensus that obtains within these communities about them. I as a Christian in important ways truly do try to base my life on insights and exhortations that I admire most. Others will do it with their scriptures. We can all respect one another for doing that while we wait. Infinite postponement is not an evasion. It’s the opposite of an evasion. It says that this is a very serious question, and in all seriousness, I don’t think I can answer it. So I will wait until someone better than I appears on the scene to do so. SR: What I also hear you saying, which is wonderful, because a lot of practitioners feel the need to proclaim the superiority of their faith in order to continue to embrace it, in order to feel comfortable that I’ve got the right one. I think what you’re saying is that it’s okay not to know if it’s the right one. You can still embrace it and live fully with it. SR: I think that’s a switch in mind set. I appreciate you saying it’s an important question but not so important that we can’t continue to live within our traditions and with each other’s traditions. Well, thank you very much! We are really looking forward to the book!